Speech by Sayed Hassan Nasrallah, Secretary General of Hezbollah, on July 16, 2006, the fourth day of the war against Israel, in which Haifa was hit for the first time. (4) Where is Hassan Nasrallah “Hiding”? “We concentrated our missile / rocket strikes exclusively on military positions, without striking any Israeli settlements or urban centers in the north of occupied Palestine. But the enemy's army, unable to face Hezbollah fighters, started from day one to target cities, villages, civilians and civilian facilities, as well as Lebanon's infrastructure. [...] So we had no choice but to keep the promise we made ourselves, and we hit the city of Haifa. [..] Our weapons are not weapons of vengeance, but weapons of deterrence, weapons whose purpose is to bring back some reason and common sense to the madmen in the Olmert government, so that they put an end to their arrogance, hubris, and I can even say their very peculiar imbecility and stupidity.” Hassan Nasrallah, July 16, 2006. “[Lebanon] is being vandalized and smashed up by a country which says it believes in purity of arms. And these civilian deaths, I don’t believe that they’re by chance. I don’t believe it was a mistake when they hit that army barracks of logistic soldiers, who are trying to repair [a bridge and restore electricity in] their own country, which they have every right to do. In a few days, there were more than 300 dead, almost exclusively civilians, thousands of wounded and nearly one million displaced. The Lebanese army, scandalously neutral in this conflict –we would learn much later that Prime Minister Fouad Siniora, who called on Hezbollah to return the soldiers to Israel, making the Resistance de facto responsible for the war, had given instructions for the army to hinder Hezbollah activity–, was not even spared in its civil engineering actions. Anxious to maintain as much as possible the national cohesion and not to play the game of the enemy, Hassan Nasrallah would not evoke these facts until 2008, nor the collusion of the Gulf monarchies, and Saudi Arabia in particular, with the Israeli aggression. But while Israel emerged as the criminal army it has always been, Hezbollah, for its part, demonstrated its ethics, targeting Israeli civilians only after several days of restraint. having no other choice to protect its own population (the final civilian / military ratio of Hezbollah victims will be the reverse of Israel's, 1/10 versus 10/1), as well as its great military expertise: while the Lebanese guerrillas achieved success after success (Israel corvette destroyed, military bases of the north localized and hit...), Israel revealed to all the incapacity of its infantry, whose attempts of incursion were immediately stopped, and even of its services intelligence, essential auxiliaries of the air force. On the first day, Olmert had pompously announced the destruction of almost all of Hezbollah's ballistic capacity, but he received a stinging denial from the ever-increasing rocket and missile strikes that hit Israel daily, until the last day of the confrontation, up to Haifa and, as the next stage will show, well beyond Haifa. This discourse, where victory and reconstruction are evoked as soon-to-be and certain perspectives, clearly shows that Hezbollah always was in a position of strength in this conflict. Support this work and subscribe to the Facebook page to get around censorship. Fox News Sunday host Chris Wallace: President Putin, thank you for speaking with us. I am going to get to some specifics about the summit in a moment, but let’s begin with the big picture. President Trump said in his news conference that our relationship has never been worse, but that changed a few hours ago. How has the relationship, big picture, between the US and Russia changed today? Speech by Sayed Hassan Nasrallah, Secretary General of Hezbollah, on July 14, 2006, the second day of the war against Israel, in which a Sa'ar V corvette was destroyed. “You'll quickly discover, o (Israeli) people, how your new government (led by Ehud Olmert) and your new leaders are foolish, stupid, do not know how to assess reality, and do not have any experience in this area (war). [...] We will not be the only ones to pay a price. Our homes will not be the only ones to be destroyed. Our children will not be the only ones killed. Our people will not be the only one to take shelter and move. This time is over: it was thus before 1982, before 2000. But this time is now over.” Hassan Nasrallah, July 14, 2006. On July 13, Israel launched a large-scale aggression against Lebanon, using the pretext of Hezbollah's capture of two Israeli soldiers the day before. As the Winograd Report itself reveals, this war was long-planned (“the longest planned in Israel's history; it had been preparing for this for six years”, stresses Norman Finkelstein), and was only hastened by the Israeli General Staff to allow the aggressor to plead self-defense, a false pretense that is the hallmark of the Zionist entity. “There were reporters embedded in the Israeli navy, watching them shell the coast of Lebanon, and I’ve seen the footage. Then, suddenly, one of those Hetz-class gunboats is hit by an Iranian missile [actually, two chinese C-802 land-sea missiles]. And within a minute, Hezbollah’s television station, Al-Manar, which has been totally bombed, pulverized, pound into dust — it’s still broadcasting presumably from bunkers elsewhere in Beirut — suddenly shows all the embedded footage on television, like “Here’s the ship. Here it is firing on Southern Lebanon. This is the ship we hit.” Extraordinary bit of propaganda. I mean, absolutely amazing, outrageously so. These two military exploits clearly distributed the roles from the beginning of the war: on the one hand, an army endowed with an unlimited power of destruction, pouring its firepower above all on civilians whom it was resolve to punish (in a few days, there were already more than 300 dead, thousands of wounded and nearly a million displaced), but unable to conduct a real ground operation because of the chronic weakness of its infantry, and on the other hand, a modest but extremely effective guerrilla force, exclusively targeting military targets (at least during the first days), with unthinkable success for Israel, and even winning the intelligence and psychological warfare hands down. Israel was amputated from the first day of a whole section of its military triad (aviation, navy, infantry). This radical impulse given to this conflict will only be confirmed later. In my first speech in these (decisive) days, after Operation “Truthful Promise", I will (only) say a few words: a word to the Lebanese people, a word to the Resistance fighters, a word to the Zionists, and a word to the Arab leaders. I have nothing to say to the international community because, just like many members of our (Muslim) community, I never believed one day in the (effective) existence of an international community. First, I say to the Lebanese people: O my dear people, who embraced the Resistance, thanks to whom it achieved victory and for whom it triumphed on May 25, 2000 (Lebanon's liberation from Israeli occupation), this Lebanese people that shaped the first Arab victory in the History of the struggle against the Israeli enemy, despite the huge imbalance of forces, and despite the abandonment of the majority of our Arab brothers, the majority of our Muslim brothers and (a deafening) silence of the world (in spite of Israeli crimes in Lebanon). The Lebanese people have shaped the miracle of the victory, who stunned the world and humiliated the Zionists, these Zionists who (since then) look upon this people in a special, unique way, because he achieved a particular and distinct feat in the History of the struggle against them. In total frankness this is the extent of the matter. The other choice is to resist, to persevere, to fight back, and as for me, relying on God the Almighty and Exalted, and on the confidence I have in Him, in the (Hezbollah) combatants and in you (Lebanese people), by the knowledge that I have of this people and this enemy, just as I always used to promise you victory, now I promise you victory once again. When (Israel launched the Operation) “Grapes of Wrath” in 1996, or (the Operation) “Settling of Accounts” in 1993, at first he had the upper hand, and our situation was much worse. But today, the situation is different. Believe me, and I mean it, the situation now is very different. We just have to wait, to resist, to face and to unite, and I know that the majority of our people is steadfast and prone to fight back, and ready to sacrifice, without need to be urged to do so, but I'm just explaining the situation and confirming our choice (to resist). And as to the Zionists, the inhabitants of the Zionist entity, at this moment, I tell you this: you'll quickly discover, O (Israeli) people, how your new government (led by Ehud Olmert) and your new leaders are foolish, stupid, do not know how to assess reality, and do not have any experience in this area (war). Today I will not say that if you strike Beirut, we will strike Haifa. I will not tell you that if you strike the southern suburb (of Beirut), we will strike Haifa. You wanted to end this equation, so let us forget it. You wanted an open war (with no red line), so be it! We are entering an open war, and we are ready, we are ready for such a war. A war at all levels. (We are ready to strike) Haifa, and, believe me, beyond Haifa, and well beyond (what is) beyond Haifa. From now on, you wanted an open war, so it will be an open war. You wanted, your government wanted to change the rules of the game, so be it, let us change the rules. Today you do not know whom you're fighting. You are fighting the descendants (and authentic followers of the Prophet) Muhammad, of (Imam) Ali, of (his sons) Hassan and Hussein, of the family of the Prophet, and the Companions of the Prophet. You are fighting a people who has greater faith than anyone on the face of the earth. And you chose to enter into open war against a nation that is proud of its history, its civilization and culture, and also has the material capability, the ability, the experience, the know-how, the calm, the lucidity, the determination, the endurance and the courage (required). In the coming days, it will be between us and you, God willing. In 1982, you said we were crazy, and the world said we were crazy (to believe we could defeat Israel). But we proved that we were the rational ones. As to (reveal) the identity of the true crazy people, that's another question. I don't want to get into a debate with anyone. I only say this: rely on your “reason” and we will rely on our “adventure”, and God is our support, and He is our Provider. [Since 1982], we never counted on you, not one moment. We relied on God, on our people, on our heart, on our own efforts and on our children. And today we do the same thing. And victory will follow, it will (certainly) follow with God's grace. May God's peace be upon you and His mercy. 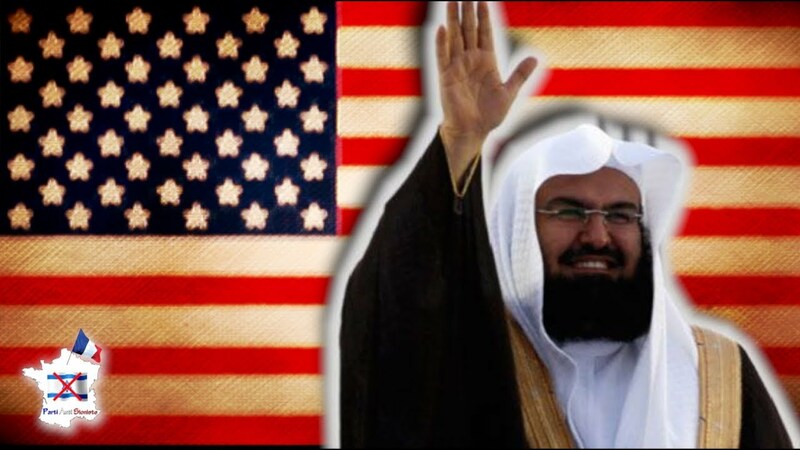 Following a conference in Geneva on June 27, 2018 devoted to “Security, its importance, and the means for its realization and its preservation”, the Imam of Mecca, Sheikh al-Sudais, who had affirmed that Trump and Ben Salmane “were leading the world and mankind to a haven of peace and security”, was long questioned by a one-legged Algerian, who eloquently denounced the criminal Saudi policy, aligned with that of Washington & Tel Aviv. Despite the servile efforts of the promoters to silence him, and especially to prevent anyone from filming the scene, it made the buzz on social networks and Arab media not controlled by the Saud, including Al-Jazeera. Sudais pitifully retreated without making a single reply, except the affirmation, without the least embarrassment, that there was no embargo against Qatar (sic). While only a few years ago, Muslims, both in the East and in the West, were widely hypnotized by the great Sheikhs of Saudi Arabia, of whom, thanks to the petrodollars, almost every Muslim household had recitations of the Quran, their aura is greatly degraded today, as evidenced by the sparse audience of this conference, and the reactions of solidarity that have manifested themselves on both video and social networks. Henceforth, the Wahhabi Saud are no longer assimilated to Islam, of which they only constitute a heretical and barbaric cult perfectly embodied by ISIS, but to what they have always been, namely an artificial entity created of all pieces and maintained by imperialism (formerly British, now American), a Western Trojan horse in the East, just like Israel. The forthcoming announcement of the so-called “Deal of the Century”, supposed to definitively liquidate the Palestinian cause, by the triumvirate Trump-Netanyahu-Ben Salman (an archetypal Team of Losers, if ever there was one), will certainly sign the death sentence of the Saud dynasty, already moribund because of its defeat in Yemen and the monumental failure of the American project in Syria. Apart from Washington, Tel-Aviv (and their satellites, agents and mercenaries) and Islamophobes of all stripes, the world can only welcome such a development. Hassan Nasrallah's press conference following the capture of two Israeli soldiers on July 12, 2006 by Hezbollah. “The Israeli enemy knows how serious, capable and ready (for war) we are, he knows we are taking our responsibilities and have the required courage and control of our nerves, which allows us to reflect (and act) with composure (and a clear) mind.” Hassan Nasrallah, July 12, 2006. In anticipation of the Great War of Liberation to come announced by Sayed Hassan Nasrallah, everyone should know precisely what happened during the summer 2006 war, a true epic whose events and details remain largely unknown to the Western public, as well as the true extent of Israel's rout, and up to the very causes of the conflict. This lack of knowledge is due to the weight of propaganda and censorship weighing on the most authentic of all (Pan)Arab leaders and the most formidable of all armed movements in History. Israel rightly regards Hezbollah as its main existential threat, just before Iran, because of its core and absolute hostility to the Zionist entity, in principle, words and deeds. Hassan Nasrallah, Secretary General of the ‘Party of God’, is the face of the only movement that inflicted two stinging defeats on Israel, fighting one against ten, and thus restoring the honor of the Arab-Muslim world. He is, according to Norman Finkelstein, the only political leader whose speeches are both perfectly truthful and reliable (although it is very difficult for us to conceive of a politician who neither lies nor even exaggerates, whatever the circumstances) and highly informative. It is enough to read –and even watch, as body language and charisma are not conveyed through a transcript– his speeches throughout the world war of annihilation that was waged against Hezbollah in 2006 to become aware of it. Up to this day, anyone who wants to understand what is happening in the Middle East cannot ignore the first-hand information and the very high-quality analyzes he regularly offers. One can only imagine the power of Hezbollah today, after the ‘Divine Victory’ of 2006 and the victorious struggle against ISIS & the Saudi-American coalition in Syria, Iraq and Yemen, which has significantly strengthened and expanded the Resistance Axis. Without a doubt, the next war will completely upset the map of the Middle East. In the Name of God, Most Gracious, Most Merciful. Praise be to God, Lord of the worlds, and His prayers be upon our Master Muhammad, upon his pious and pure family and his chosen and faithful companions. Salutations be upon you and God's mercy and blessings. First and last, praise and thanks be to God for the victory, jihad, glory and results He has bestowed upon us. I must begin by addressing the heroic mujahedeen (fighters) who today fulfilled our promise (to liberate our prisoners held in Israel). And therefore their operation was named "Operation Truthful Promise". I offer them my sincere thanks and kiss their foreheads and hands. By the grace of these heads raised high and these heroic fighters, we will all keep our heads high, and none of our (Lebanese) fighters will remain chained in prisons of the (Zionist) occupier. Today is the day of loyalty to Samir Qintar, Yahya Skaf, Nasim Nisr, and all the brothers, all the prisoners and all those detained in the prisons of the occupier. Similarly, I must express my respect and my thanks to all the Lebanese, all the Palestinians, all the Arabs and all the Muslims who expressed their joy, their happiness and their support, whether (political) leaders, religious authorities, parties, forces, personalities, scholars or humble and good everyday citizens who took to the streets and expressed (their happiness) in their way. To all those, I express my respect and my thanks, especially to our people in southern Lebanon, in the villages located on the front line, who remain until this moment and will remain by the Grace of God steadfast, patient, confident and stronger (than the enemy), contrary to some media reports that evoke a mass exodus situation, problems, etc., but this is not true. More on that in a moment. I begin with the operation (itself). Of course, I will not mention (in detail the) data from the field, press releases from the Resistance will take care of it. Several press releases have been published. The Resistance announced that it captured two Israeli soldiers. Naturally, our custom is to reveal every detail in due course. How, when, where, everything will be revealed later. The Israelis have also acknowledged that two Israeli soldiers were captured. It seems that there were casualties among the soldiers of the occupation (during the operation), three deaths. There is now talk of seven dead because after the operation, an incursion... There are even some Lebanese media that speak of a (large) incursion of Israeli forces on Lebanese territory. Someone who gets informed (only) via these media would wonder "How have they arrived in Beirut without us being aware of it?" This is not true, there was no incursion, except on one point, the Raheb position west of Ayt al-Sha`b, where an Israeli tank approached and was destroyed, causing (Israeli) deaths and injuries. And a few hours ago, the Israeli enemy, through several mediators, called for a cease-fire at this point on the border, to retrieve his dead and wounded, but we said the situation needed a comprehensive cease-fire, not just on a specific point. Should we give them a cease-fire on one point while they, on their part, strike bridges, positions ?... It would be illogical. Thus, the four additional victims were caused by the destruction of the tank during the first Israeli incursion into Lebanon. So far there are no Israeli incursion into Lebanon. That's all for my brief overview of the reality on the ground. Of course, the two Israeli prisoners are already in a safe place, far, far away (from the border with Israel)... Hitting a bridge here and there, while the operation took place at 9:05 am (is completely futile). It was only at 10:30 am or 11 am that the Israelis got aware of an incident and wondered what had happened, what was the situation, etc. So those who have captured these soldiers at 9:05 am had time to get them (as far as) they wanted. Anyway, press releases will reveal the details of this operation, this atmosphere, etc. The second point is that what happened today... I will not enter into a debate to establish whether we legally had the right or not to do it (under Lebanese law), what is (the relevance of) this choice, what are the (other options), etc. I'll just say two words, expressing myself in my own way: it is our natural right, and that is the ONLY logical way possible. This is neither the international community that will free our prisoners, nor international organizations, nor regional organizations, nor governments, nor regimes - with all the respect due to them -, nor political negotiations, I mean negotiations being led without bargaining counter. None of these can release a single prisoner. Capturing Israeli soldiers is the only reasonable choice. If someone has another solution to free our prisoners and detainees from Israeli jails, he please let us know, and if he knows another way to free them, he please explain us why, for 20 years and to this day, he has not implemented it, why he did not do it. Therefore, what we have done today is first our natural right, and I do not want to get into any legal, philosophical or political debate on this issue, and secondly, it is the only way, the only way 1/ to free the prisoners and Lebanese detainees from Israeli jails and 2/ to bring to light, worldwide, up to the highest international organizations and in all media of the world, the suffering of thousands of Lebanese prisoners, Palestinians and Arabs - our Lebanese quota today is reduced in quantity, but not in pain - and families of detainees, so that the world opens his eyes to the tragedy of tens of thousands of prisoners and tens of thousands of families, and to this constant humiliation (inflicted on all Arabs). What happened today, just like what happened in the Gaza Strip (capture of Israeli soldier Gilad Shalit) highlights this problem and puts the world in front of its responsibility with regard to this suffering. So much for the background (of our operation). Of course, we haven't surprised anyone, and it's been over a year that I said, or at least during this year (2006), that we wanted to take prisoners in order to exchange and liberate our prisoners and detainees. Is it true or not? I reminded it on more than one occasion, and after each statement, the Israelis in the border were in a state of alert, and they were already in a state of alert, even before what happened in Gaza. The decision had already been taken, and for 2006, the Resistance had made the capture of Israeli soldiers a priority to close once and for all the file of prisoners. That was our top priority. We compelled ourselves to restraint on all issues, despite the difficult conditions, but the only exception (to our restraint) was always (capturing soldiers). And myself, at several internal meetings, I have informed some political leaders that the only exception was taking prisoners. (We have clearly said that) we could neither forget nor ignore this suffering, nor delay (our action): at any time, when the opportunity to take prisoners would present itself, we would seize it without any hesitation. And that's really what we did. Today, the operation took place within this framework. And of course, its nature and timing are undoubtedly a great help and great support to our brothers in Palestine, who get killed every day under the eyes of the world without anyone uttering a single word (of denunciation) nor anyone undertaking any action (to stop it). One would really believe that there is no intelligence left in this world, nor values, ​​nor honor, nor nobility, nor courage, nor moral, nor humanity... Today, the mujahedeen (fighters) of the Islamic Resistance (in Lebanon) want to revive those values ​​in the (Muslim) Community. But naturally, it came as part of a decision taken before the events in Gaza, (I precise it) so that no one imagines more interference than there actually was between the events in Lebanon and those in the region. Today, this operation took place, and the prisoners are in our hands. On its part, until now, Israel has carried out a number of actions in response. We have shown great restraint, but any incursion or any approach from Lebanese territory was faced with great force, and also, a half-hour ago, we hit a number of positions of the Israeli military command as a clear message: the restraint shown by the Resistance so far is neither weakness nor hesitation. The message is clear: we are fully prepared to go very far, even if we continue to exercise restraint and to conduct response actions calculated and well thought out. How do we see things? Here is what we say in anticipation of the meeting of the Israeli (political and military command) to be held around 7 or 8 pm (today) to determine their response to this major development that has just occurred in Lebanon. Here's what we say: these two prisoners in our hands will return to their homes only through one way, namely indirect negotiations (Hezbollah refuses any direct relations with Israel), a prisoners exchange, period. No one can, in this whole Creation, return them to their homes, except through indirect negotiations and an exchange. If Israel wants to consider any military action, if its objective is to free the two prisoners, then he is deluded, he is deluded, he is deluded, he is deluded - (repeat it) until you lose your breath. All the power of Israel, even backed by all the power of the world, will never be able to bring these prisoners back into their homes - I mean their usurped homes. Any military action therefore has no horizon and no hope of successful outcome if the goal is to free the prisoners. Israel can do whatever it wants, it will be futile. Of course, since the first moment, the government, the people and the Resistance are under considerable pressure from the US ambassador, the UN envoy, foreign embassies... You can hit your head against the wall and threaten us as much as you want, (it will be futile). In 2000 (after the Liberation of Lebanon), we faced a similar situation of threats and intimidation. Anyway, any military operation whatsoever will fail to liberate the prisoners. I am categorical. It is useless for me to explain at length the reasons why, because I believe that all those who hear me clearly understand what I mean. The only way, as I said, is indirect negotiations that will lead to an exchange (of prisoners). But if the goal of a military operation (by Israel is not to liberate the prisoners but) to have Lebanon pay a price... Perhaps they will recognize that they can not free the prisoners, but they'd (still) want to have Lebanon pay a (very high) price for the operation carried out by the Resistance in southern Lebanon. In this regard, I will be very clear and very precise. I know how the situation is tense for Israel, Lebanon, Palestine, the Arab world and internationally. I know exactly how we are, what position we are in. Our goal for the operation, which took place this morning at 9:05 am, was to capture Israeli soldiers to exchange them (for our prisoners), period. We do not want escalation in the south, it is not our intention. We do not want to bring Lebanon to war. We do not want to bring the region to war. Any effort to bring calm... I do not ask (Israel) for calm. The last time, 27 March (2000), we had not requested a cease-fire with Israel. And I take this opportunity to tell the world that international powers had then contacted us to inform us that they wanted to establish a cease-fire, and we said that we had nothing against it. I do not ask for cease-fire, but if any (international) part wants to intercede to implement a cease-fire, we have no problem, because we do not intend to to go war. But if the Israeli enemy wants escalation, and think, as usual (when dealing with Arabs), that he has to extract a (high) price from Lebanon, we are ready to fight, until the farthest end that this enemy and those who stand behind him can imagine. Today, the Israelis in power (lack of experience at their position). Olmert is a new head of government. The Minister of Defense is new, the Chief of staff is new. They are all new (in their position). I advise them, before their meeting at 8pm, to question previous heads of government and ministers about their experience in Lebanon. When someone is new on the job, he can be deceived (by advisers, etc.). So that no one tells them stories, they should ask their predecessors to make sure (of what awaits them in Lebanon). Second, what led to this operation is the enemy's outbidding in the government during the previous exchange (of prisoners). During previous discussions, we had reached an agreement that included Samir Qintar, Yahia Skaff, Nasim Nisr and others. But the outbidding within the enemy government and the votes that have been held, if you remember, 12 votes against 11, have left these young (Lebanese prisoners) out of the (prisoners exchange). The outbidding that have thwarted this exchange thus led them to (today's) military solution (the capture of Israeli soldiers). Today, I advise them not to outbid each other, and to draw lessons from all the previous experiences. As for us, we are ready (for war), more ready than anything the enemy can imagine, and we have been preparing for such a day for years, since May 25, 2000 (day of the South Lebanon Liberation). On 26 May 2000, the world went about his business. Since May 26, 2000, the world (forgot all about it), but Hezbollah is preparing for the day when such a confrontation is imposed on Lebanon. I declare to the (Israeli) Chief of Staff, who threatens to send Lebanon back 20 years, that Lebanon today is very different from what it was 20 years ago. The Resistance is very different, its capabilities are very different, its morale is very different, its determination, its land, its people... It is a false analogy, he compares two very different things. I do not need to resort to threats or promises. For it may be that one who threatens a lot will not do much (in the end). You know Hezbollah and its credibility, so two words will suffice (to sum things up). Prisoners will return (to Israel) through indirect negotiations and an exchange; if the world wants peace, we are ready for peace; if the world wants confrontation, we are ready to go to the bitter end in confrontation. And if they choose confrontation, they should expect surprises. If they choose the surprise - forgive me, the confrontation -, they should expect surprises. We do not dread such a confrontation, we do not hesitate at this perspective, and we would go there with great determination, an unwavering faith and certainty to be victorious with the help of God the Almighty and Exalted. And I know that in this confrontation will be with us all the righteous and sincere men (and women) of our Lebanese people, of our Arab and Islamic nations and all free and worthy men (and women) of the world. We are not isolated. Those who will find themselves isolated in this (Muslim) Community are those who take the side of the enemy. Those who will be in unison with this (Muslim) Community are those who take the side of the Resistance. That's my message to the enemy. As for my message to the inside (Lebanon), this is not the time of outbidding, discussions and debates. I do not ask for anyone's help or support. I do not ask for anyone's help or support. But I would like to draw the attention of the Lebanese, be they officials or not, to the fact that no one should behave in order to encourage the enemy (to attack) Lebanon. Let no one adopts a language or conduct which constitutes a cover for Israeli aggression against Lebanon. This is the time to support and cooperate in order to face this challenge. Then we will be ready to discuss and argue as much as you want. I warn against any error that would be a help, support and encouragement to aggression. This is where the national feeling and sense of responsibility should come out. We behaved with a high sense of national responsibility. If you want to debate the correctness or error of our act, no problem (but later): now, the country is facing a challenge, and everyone should act with a high sense of national responsibility. The Lebanese government must act with a high sense of national responsibility. Today, there are highly virulent calls demanding that we immediately give back the two Israeli soldiers in good health, otherwise we will face a very difficult situation, as they say (with their pseudo-diplomatic language). Of course it is natural that they threaten us of (tragic) consequences. What can I answer that? They demand that we free the two soldiers. Perhaps they want us to simply hand them back, and present them our (humble) apology? What next? In what (illusory) world do they live? In what world do they live? What they are asking for is absurd. It is true that the Lebanese government is responsible for protecting the country. One aspect of this protection is not to expose Lebanon against Israeli aggression. That's my message to the inside (Lebanon). My message to our Palestinian brothers: arm yourself with patience, continue to resist, to endure (without yielding). It may be that what happened today in Lebanon is a relief and a solution for the current crisis in Gaza (since Israel will have to pull back to deal with Hezbollah). Israel says it will not negotiate with Hamas, because the operation (capture of Gilad Shalit) took place in Gaza. Very good. But that's what you always tell us (o Israel). At first, you say no, but then you say yes. After a week, after a month, after a year... In the end, you will be forced to say "Ok, let's negotiate." Maybe one of the issues will be (that Israel will realize) that 1 + 2 = 3, and agree to negotiations. As for us, we have no objection to conduct this effort jointly between the Lebanese and the Palestinians in order to get out of all this crisis that the region entered because of the occupation, ​​the Israeli aggression and the continued, heinous and inhuman captivity by Israel of tens of thousands of prisoners in Israeli jails. In Palestine, there are endurance, as in Lebanon, and with the grace of God, all this (Muslim) Community is present with us, and we will manage to overcome this stage. I also said to the media that they too must behave with a sense of responsibility. Let no one behave in the media in a way that will play into the enemy's hand, or by creating an atmosphere of terror, despair or scaring people, which would be a service rendered to Israel, and some media are already doing that. This is a (real) service rendered to Israel. They say false things, broadcast (pseudo-)facts that have no reality, and present... Even the way they present (the situation) parrots the Israeli (psychological warfare) that try to scare people. Regarding the Resistance, neither Israel nor the media that broadcast Israel's (false propaganda) will frighten us. But I want to say that the media also have a key responsibility in this regard, namely the morale of people in Lebanon, especially in the South. I was in constant contact with the inhabitants of the first line, with our (Hezbollah) brothers there. The situation of the villages, towns, boroughs is this: people express a feeling of great victory and they are truly celebrating. And the readiness of people to steadfastness and enduring (difficulties) is very high. And it's the same situation in occupied Palestine. I hope that some pessimistic people quick to despondency will not work to disseminate and propagate an atmosphere of despair that exists only within themselves by claiming (falsely) that it is the general feeling. Then... This is not the time to settle internal accounts. Now there is a national battle, a national position, and anyone who (wants to take advantage of this situation to) settle internal accounts will lose, the country will lose and that would be a service rendered to the enemy. We do not want to get into an argument with anyone domestically. We call on everyone to act with a (high) sense of national responsibility. We are, with the grace of God, steadfast and firmly camped on our positions, and we are ready for all possibilities. For all possibilities. And you know me, I never exaggerate, and I do not try to give morale (at the expense of reality). The morale of the mujahideen (fighters) and people is greater than any words we could say. I want to conclude with a call, and then I will be willing to answer your questions. By the land of southern Lebanon, the land of Palestine, the blood of Lebanese and Palestinians martyrs, the blood of the wounded, the destroyed houses, I appeal to the Iraqi people. I call on the Iraqi people. We call on you in the name of all that pure blood that was spilled in Lebanon and Palestine, the blood of Lebanese and Palestinians, especially the Sunni and Shiite, to tell you: O our dear and beloved brothers, do not advance further into the slope (of sectarian war) on which you are. Those who sow dissension and hatred among you are the American occupiers and the Zionists. Look for the hands of Mossad (agents) who were recruited from all over the world and were brought into Iraq to kill here and there, making attacks here and there (among both Sunnis and Shiites) in order to push Iraq to a Sunni-Shiite war, and therefore spread this (sectarian) war to the entire region. The Iraqi people, Iraqi officials, Iraqi religious authorities and Iraqi (political) parties, regardless of their different tendencies and inclinations, we always called them to (national unity), but today especially, when there are martyrs in southern Lebanon, Palestine, there are martyrs every day, we call on them in the name of what Shiites and Sunnis hold most dear, namely the blood of their loved ones, their children, their men, their wives, their children, to be vigilant against the enemy who wants to destroy, disrupt and humiliate this (Muslim) Community, and to make the whole world walk its way and serve its interests. I listen to your questions. Please go ahead. Hassan Nasrallah: I hear you, go ahead. Journalist: [Inaudible] Will the strategy be the same as for the previous (prisoners exchange) operation? And can we get information on the fate of the two soldiers?Hassan Nasrallah: All this is premature. Let us already go past the stage where we are, before we talk about the strategy of negotiations, the demands –I tell you this to avoid further questions I cannot answer–, what are the information, data, details, everything will come out later. The current priority is to overcome the current situation. Please, go ahead (for the next question). Journalist: Eminent Sayed (Nasrallah, descendant of the Prophet), you sent a message to the Lebanese interior. But what about (taking) the decision of war and peace? The decision of war or peace cannot be in the hands of one Lebanese group, because the consequences of any military operation will affect all the Lebanese, not just you. How do you respond to that? Hassan Nasrallah: Can we hear the questions well on television? The important thing is that we hear it on TV, I know you can hear them (from the conference room, and me too). The issue of decision-making on war and peace is one of many debates in Lebanon (Hezbollah is accused of deciding for the State), and I do not want to get into it because this is not the time. This requires a calm atmosphere. On the (intra-Lebanese) dialogue table, it was part of the discussions. But I ask you a question: if we were to wait for a Lebanese unanimity, a unanimity of the Lebanese government or a unanimity on the Lebanese dialogue table, on the decision to launch an operation to capture prisoners, be it now, in a year or in a hundred years, would they manage to make this decision? They would never make it. These young people would remain in prison, and this suffering would be perpetuated (indefinitely). Ultimately, this is the way we see things: (Israel) occupies (a portion of Lebanese land), attacks us, daily violates our sovereignty, holds (Lebanese nationals) prisoners. So it is our natural right (to capture Israeli soldiers). And we believe this is consistent with the Ministerial Declaration of the Government. If I say more, I would get into the debate, (and I refuse to do so). Journalist: Eminent Sayed, an Arabic channel aired a report claiming that the Israeli soldiers who were captured are Druze, that they belong to the Druze community, this of course to diminish the importance of this event. How do you respond to that? Hassan Nasrallah: The young (Hezbollah fighters) who captured them did not ask their identity card nor their sect. And besides, I think the (Israeli) identity card does not mention it, unlike us in Lebanon, where religion is mentioned. The important thing is that they are Israeli soldiers, who are part of the Israeli army. Their religion, sect or community does not matter at all, it makes no difference to us. (Give the microphone) to this sister. Journalist: Eminent Sayed, you talked about indirect negotiations that will lead to an exchange (of prisoners). Have you been contacted by parties that could play this role, such as Germany for example? So my first question is about the exchange. My second question is this: with everything that happened at the Lebanese-Israeli border in recent months, aren't you surprised by the presence of this small group of Israeli soldiers patrolling alone there? Don't you think that it was a trap (a bait)? Hassan Nasrallah: [Laughter] If only it were true... (Israel offering us prisoners on a plate)! Regarding the first question, no, no such contact occurred. Everyone's priority is to pressure the Resistance and Lebanon to secure the release of these soldiers without anything in return. Such is their current priority, be it the US, the UN, the international community and foreign embassies. And of course, we did not accede to their request. At a later stage, when their efforts have led to a dead end, we'll see who will be the intermediary and who will offer to intercede for negotiations. But now it's premature. As for your other question, no, they were not merely stretching their legs or anything like that. For several months we prepared this operation, we made considerable efforts, and we did a very precise work with high professionalism, and God granted us success. Please, go ahead. Take the microphone please. Journalist: Excuse me, Eminent Sayed, but have you contacted the government to coordinate your operation with him? Hassan Nasrallah: We did not coordinate with anyone before this. If I told the government that I was about to perform an operation to take prisoners, I would make him carry a heavy responsibility. Hassan Nasrallah: Oh, you mean after the operation, of course, there are contacts. Since the first moment, there are contacts with several political leaders, with the head of government, with the President of the Council, with the President of Parliament, with a number of concerned political and religious leaders, and there was a meeting between the Prime Minister, Fouad Siniora, accompanied by his political help, Hajj Hussein Khalil, and we are in constant contact. We are discussing to see what we can agree upon. Journalist: Eminent Sayed, regarding the exchange (of prisoners), is it going to be done according to the requirements you announced, meaning it will only concern Lebanese prisoners, or will the exchange extend to Palestinian prisoners as well? This is my first question. Second, if today or any day, an Israeli response against Lebanon happened, God forbid, and Lebanese voices rose to hold Hezbollah responsible, what would be Hezbollah's answer (to this accusation), beyond the messages you sent today? Hassan Nasrallah: Regarding the first point, it is premature. Any question about the negotiation itself, the negotiating strategy, the demands, we'll talk about it later. Regarding the second point, regarding any Israeli aggression, the Resistance has the duty to defend Lebanon, and will do so by the grace of God. Naturally, there will be voices opposing us because there has always been opposing voices. I have repeatedly stated that there has never been a national consensus on even a cause of such clarity, since 1982 (even Resistance to Israel was in minority, but Hezbollah did it just the same), and even today there is no national unanimity. There is no problem with that. Therefore, it will not change anything regarding our defense and our efforts. Of course, I hope we will reach a national solidarity on this issue, and that everyone will have a responsible attitude: the government, political leaders... And I hope that the head of government will follow the example of the martyred President Rafik Hariri in 1996, when he traveled the whole world and spared no efforts to stop the (Israeli) aggression against Lebanon. He had a different view from ours, he did not agree with our (military) operations, he was criticizing their timing, but when the challenge (war) arrived, he behaved with a high sense of national responsibility. We now expect the President of the Government, who claims to be on the same line as martyred President Rafik Hariri, to behave with the same sense of national responsibility that martyred President Rafik Hariri showed. Next question, Imad? Let me give the floor to the other side of the audience. Hassan Nasrallah: It does not determine anything. As long as there is (Lebanese) land occupied... You can consult the legal verdict of the late Professor Edmond Naim. There is a clear legal basis in international law: if a single inch of our territory is occupied, we have the right to launch an operation in Tel Aviv. Under international law, if a single inch of our territory is occupied, we have the right to do an operation in Tel Aviv. We have not made our operation in Tel Aviv. We are not (fully) exerting our rights under international law. Therefore, whether we capture these soldiers in the Shebaa Farms or in Ghajar (occupied Lebanese territories), on the barbed wire demarcating the border, a few meters inside Israeli land or within Lebanese territory, it does not change anything legally. We have every right to do so under international law. In addition, they hold Lebanese prisoners. They made prisoners of war. Similarly, when there are prisoners of war, you have the right to capture enemy soldiers to make an exchange. It is perfectly clear. Now you can tell me that it would have been better if we had captured them on (Shebaa) farms. If they had come to stretch their legs there, we would have captured them. Journalist: Eminent Secretary General, how do you interpret the statement of the Israeli enemy Chief of Staff that (Lebanese) government would bear all the responsibility for what happened today, and that it was a matter between State (Lebanon) and State (Israel)? And if you allow me another question, what do you say while you are sending wonderful news to the prisoners held in Israeli jails, especially the oldest of them, Samir Qintar (since 1979)? Hassan Nasrallah: First... What was the first question? I'll answer the second question. At first, the operation was called ‘Freedom for Samir Qintar and his brothers’. But as it is a rather long name, we opted for ‘Operation Truthful Promise’, more catchy, and of course the promise was the one made to (free) Samir and his brothers. And therefore I say to Samir and his brothers that they are now on the path to freedom. It's only a matter of time: negotiations, discussions, overcoming this difficult stage, and by the Grace of God, they will be out soon. Hassan Nasrallah: Oh, sorry, I remember. Israel always blamed the Lebanese government. Why (wonder), is there a day when they did not held the government responsible (for Hezbollah operations)? Even in Palestine, President Yasser Arafat was a prisoner in Ramallah and anything that happened, they held him responsible for it. It is a well-known Israeli policy. They hold Syria and Iran responsible, it's logical... Sorry, it's not logical, it's their logic. It is natural and normal (for them). Journalist: Eminent Sayed, there is no doubt that this operation has restored the morale of many Lebanese and Palestinians, but have you really considered the consequences of this operation, and the possibility of an Israeli response in Lebanon, especially as the economic situation in Lebanon would not stand it? And another question, how will this operation support Hezbollah's views on the (intra-Lebanese) dialogue table? Hassan Nasrallah: On the table of dialogue, everyone has his own logic. And I think we were trying to get somewhere, we were in a positive trend. And when anything happens, I can read it as going in my direction, and others can read it as going in their direction. But in truth, our goal was not to strengthen our views on the dialogue table or any such thing. We just considered that there were (Lebanese) prisoners in Israeli prisons, that they would only return via an operation (to capture enemy soldiers) and an exchange, and that's what we have done. That's the full extent of the issue (without any domestic policy consideration). As for the (possible) consequences, we obviously took them into consideration. But anyway, we consider that this is part of the struggle (against Israel), in which we must all make sacrifices. And in the past, I said on more than one occasion, and I repeat it today and thank you for your question, which gives me this opportunity: I wish that all Lebanese mothers today will put themselves in the shoes of the mother of the prisoner Samir Qintar, and imagine that it is their son in the place of Samir Qintar, not Samir Qintar. Imagine that your own son (is jailed in Israel since 1979). How then would this mother, this father, this brother, this sister (of a prisoner for nearly 30 years) behave?... Consider the issue in this humanitarian perspective. Everything that is of a material nature can be compensated. But when we talk about feelings and humanity, what is lost is lost. Journalist: Eminent Sayed, you reduce the question to a simple matter of prisoners held in Israel, but there are threats (of war) against Syria, and you may have brought the region to war. What do you do of the international community and UN Resolution 1559 (calling for the withdrawal of foreign troops, especially Syrian, from Lebanon, and the disarmament of militias). Why (reduce it all to nothing)? Hassan Nasrallah: Very good. What you are saying is the same logic as in 1982. In 1982, when the Resistance was founded and fought Israel, Israel threatened Syria, Iran, the Arab governments and Lebanon, and with each operation of the Resistance, the threats were repeated, we were told that we brought the region to war, etc. Why, has the Middle East known anything but war (since decades), for us to be the ones who would bring war to the region? The region is (already) at war. Now whether it be a cold war, whether it heats or cools a bit, (we are still in a permanent state of war). But if we were to accept this logic, our territory would still be under occupation, and it would contradict our previous logic (which led to the liberation). Our prisoners would remain in jail, our territory would remain occupied, our sovereignty would remain constantly violated. We have never considered, and I do not know if anyone considers that Lebanon has (ever) left the state of war (with Israel). Let everyone consider that it is their own children (rotting) in (enemy) jails, and let them tell us how they would behave. Hassan Nasrallah: And we hit military command positions. Journalist: Yes. What is the dividing line, Eminent Sayed, between restraint and response to attacks? Is this the death of civilians, strikes against Beirut, more ground incursions?... Did you set a (red) line after which you wouldn't exercise restraint anymore? Hassan Nasrallah: Let us handle this. It is not proper for me to tell Israel how we are going to behave. That's why I do not give details, I do not threaten, I do not promise (Hezbollah prefers secrecy and surprises). Israel knows that we are serious, capable and ready, that we take our responsibilities, and that we have the required courage and control of our nerves, allowing us to think (and act) with composure (and a clear) mind. Therefore, let's see how things develop, and by the Grace of God, everything will end for the best. Journalist: Eminent Sayed, it seems that your hopes for the Lebanese internal situation are not very promising. Because during the Council of Ministers that took place at 2pm, there were differences in the positions. Are there any efforts on your part to make contact with Lebanese (personalities) from the March 14 (coalition, opposed to Hezbollah), such as the minister (Walid) Jumblatt, Dr. (Samir) Geagea, to tell them that this time is one of national challenge (and union) and not of internal strife? Hassan Nasrallah: I said that I address my appeal to all. Because if I had to contact (individually) this leader, this other leader, another still, etc., for us to debate what happened, (it would complicate things). Anyway, what happened happened. Whether that was right or not is another question. If someone wants to hold us accountable, I am ready to assume my responsibilities and accountability. If what we have done is against humanity, ethics, the nation and the people, then (I know nothing about these notions)... We must think in this perspective, not (ignore these fundamental values). Anyway, like I said, I hope that everyone will take his responsibilities in a patriotic way, and I hope that every government minister will attend the imminent or ongoing meeting, each leader from the March 14, March 8, May 10, February 14 (coalitions) and all the names you want, I hope they will all consider that it is their own son who is being held in Israel, and not Samir Qintar. How would they react then? And then I will accept (everything you say). Provided that they are sincere. Let they tell me how they would have acted, and I will accept it. Journalist: Eminent Sayed, you said in your speech that the prisoner exchange with Israel could include Palestinian prisoners. Do you not consider that this announcement and this approach mix two different issues and contradict your agreement with the Free Patriotic Movement (FPM of Michel Aoun), namely that the actions or the role of the Resistance would be limited solely to the protection of Lebanon? Do you not consider that it is an expansion of the role of the Resistance? That's the first question. Second, also in relation with March 14: so far, no leader of this coalition has taken a position. Do you not consider that the lack of position so far is in itself a negative position, which would indicate a political divide on the issue of the capture of the two soldiers that occurred today? Hassan Nasrallah: Regarding the first point, no, it does not contradict our agreement because the issue of prisoners is that of Lebanese prisoners. And frankly, if Israel had released all Lebanese prisoners during previous negotiations and exchanges, it would have deprived Hezbollah of any reason to capture prisoners. But I have reminded that it is their outbidding that led to this situation. Therefore, I hold them responsible. If prisoners are in our hands, and we have the possibility to free Lebanese, Palestinian, Syrian, Jordanian, Arab prisoners, regardless of their number and without going into details, and I say ‘No, I just want the Lebanese prisoners’, it would be against humanity. This does not contradict our agreement (with the FPM). Regarding the March 14 forces, they may take the position they want, it is up to them. They usually take their time and study very well the questions (before deciding). For example, with the Mahmoud Rafi case and the (Israeli spy) networks, it took them a week to take a stance and announce it. Of course, the current situation is very urgent and cannot wait a week, and I think by tomorrow, the positions will be announced as there is a great national challenge, and I repeat my call to preserve the nation and the country, and for all to behave with a (high) sense of national responsibility. Journalist: Eminent Sayed, you reminded that it is time for cooperation and mutual aid, and later you will be ready to debate all this. If it ended well for Lebanon and the exchange of prisoners succeeded, would it be a basis for a broader framework in the debate about the defensive strategy, and particularly the future of the weapons of the Resistance? Hassan Nasrallah: It's possible. It's possible. Please, go ahead. I'm going to answer two more questions. Journalist: Eminent Sayed, if a war between Israel and you occurred, do you expect support from Iran? And what about Syria, whose front (with Israel) is closed since 1973? And is it true that you secretly met with President Bashar al-Assad? Hassan Nasrallah: [Laughs] No, by God, we have not met recently. So much for that. For the other point, Syria and Iran have always supported Lebanon, but ultimately, it is our territory that is occupied. I will not wait (to see) who will help me or not, who will open a front (against Israel) or not, everyone is free to make the choice he wants. In Lebanon, we fought and we recovered our land. We captured enemy soldiers, and we recovered our prisoners. And we continue on the same path. Syria and Iran have always stood by Lebanon, and we thank them, and I am confident today about their presence alongside Lebanon and Palestine. And right now, they are under enormous pressure from various international parties, they even are submitted to threats. But I consider that their position (on our side) is very strong, firm and resolute. Last question over there, please. Journalist: Is it true that your recent rapprochement with the Future Movement (member of the coalition opposed to Hezbollah) is a political cover for the operation, carried out according to this timing? Hassan Nasrallah: No, because we have been preparing the operation for five months. For five months, and until today, we had many internal political debates, sometimes the situation was calm and sometimes there was trouble, then a return to calm, and alternating between disputes, cooperation and alliances. Ultimately, the question of the capture (of soldiers) to free prisoners from Israeli jails is for us independent from any domestic data, whether we are in a situation of calm, disputes, cooperation, alliance, (it makes no difference), we completely separate these issues. Resistance fighters were seeking to capture soldiers so that we have prisoners, without regard for the internal situation, varying between dispute and dialogue, the latter seeming to prevail lately. Today, all the Lebanese people and political forces in the government and those of the opposition demand that the government do its work in the social sectors, the standard of living and economy. They came to ask us if we wanted such action, and we said that we were ready for this. Of course, we always asked, we ask and we repeat every day that the country needs a government of national unity, and this is our logic and our position, but while we demand a national unity government, we remain open to any cooperation (to solve problems with) electricity, social security, water, various issues, minimum wage, etc. Ultimately, there is no contradiction... There is no contradiction between this and the cause of the prisoners detained. They are two completely different issues. I must conclude. Okay, go ahead. I'm going to take two quick questions. Journalist: Sayed, regarding the words you addressed to [Ehud] Olmert and to the meeting of the Israeli government planned tonight, given the fact that the (enemy) attacks are continuing, did you set a defined period (after which you will take other measures) if the attacks continued? That's the first question. Second, regarding coordination with the (Lebanese) army, today, is the Resistance coordinating military actions with the army to deal with aggression? Hassan Nasrallah: You know, the army in the south is always in an alert state, and the choice and the decision of the army is to defend the country: that's how it has behaved lately, and that's how it will behave in the future. There is of course cooperation on the ground, in the past and in the present, to the extent required. So much for that question. As to set a time (after which we will strike back), making promises (of retaliation), this is all premature. Let us see how things will evolve and act accordingly, in a well-studied and calculated way. Please go ahead. This time it really will be the last question. Go ahead. Journalist: Eminent Sayed, you have accustomed us, you and Hezbollah, to always be very precise and rigorous in your analyzes, and you just talked about the regional and international situation. What (secret informations you may have) pushed you to do this operation with this timing? Because you do nothing by chance, you always study very well the regional situation. Hassan Nasrallah: Yes, we study all matters thoroughly. Since the beginning of 2006, we decided to capture Israeli soldiers, and we have given this order to our young fighters of the Resistance. And as soon as they got the opportunity, they captured them. If you do not believe me, what can I do? That's the whole story. There is nothing more. It is as if someone was painting something, and others would come philosophize (and claim to know what he has painted better than him). There is nothing more (than what I said). We considered that whatever the conditions and data were, it was essential to take prisoners, whatever may happen. That's what we had resolved. Of course, I want to conclude today by evoking the martyr of the Resistance, who did not fall during the operation but during the confrontation that followed it, the civilian martyrs, the wounded... I do not know yet if the (injured) Lebanese army soldier died or not. There are civilian casualties. You know that we follow all these details closely in the media. These martyrs are our martyrs to us all, the martyrs of the nation, of the Resistance, of dignity, of freedom, of honor, like all previous martyrs, thanks to whom we achieved these successes. We wish healing and health to the wounded, and by the Grace of God, with perseverance, determination, will, wisdom, conscience and courage, we will cope with this difficult stage by securing first the ethical and humanitarian interests we all long for. Peace be upon you and the mercy of God.